The Belcher Supply Co. Inc. The Belcher Supply Company Inc. Initially we were the idea of Tony Singleton, who, in 1993, got us together as a four part harmony group to sing American shapenote music, both from The Sacred Harp, and from Northern Harmony, on a monthly basis. Our early sessions took place in Jill Thompson’s house in Brighton, but from 1994 we practised at Rachel’s home in Lewes. We called ourselves ‘Southern Harmony’ at the time, and our first public appearance as a quartet was in an ‘American Evening’ concert with the West Gallery quire, Sussex Harmony, at St Thomas à Becket church in Lewes, on Tuesday 4 July. We were all members of Sussex Harmony (Edwin was a co-founder) and as a group between 1995 and 1997 we made contributions to Sussex Harmony concerts. Why The Belcher Supply Company? In 1996 the quartet had an opportunity to appear in the Bracknell Folk Festival, and decided to look for a name with a unique selling point! Sheila and Rachel had met Bruce Randall, musician, composer, trombone and sackbut player extraordinaire from Haverhill, Massachusetts at the New England Sacred Harp Convention in Vermont, the previous year, and he coined the phrase in a letter to Sheila in March 1996. It was a pun on Supply Belcher, who was a prolific psalmody composer from 18th century Maine, and some of whose music was already in our repertoire. She responded saying it sounded a good name for a singing group, and could we use it? Bruce was delighted and the rest is history. We continued to sing as a group until Sheila and Edwin moved to Oxford early in 1998. Tony, Sheila and Edwin still perform together with Steve Fletcher as Babylon Lane. In March 2010 we reformed to run a very successful shapenote workshop at Teignmouth, Devon. We had so much fun then, we’ve gone back into business as a group, and have expanded into The Belcher Supply Company Inc., recruiting the services of Lin Cawthorne, Nick Hall and Dilwyn Scott for a workshop in Stroud on 19 November 2011. 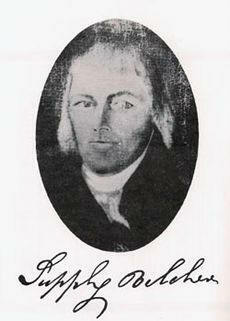 Supply Belcher (29 March 1751 - 6 June 1836), of Farmington, Maine, was a tavern keeper and tax collector. Compiler of The Harmony of Maine, pub. 1794. Composer of nearly 70 psalm and hymn tunes, including The Lily and Conversion (Sacred Harp 297). as well as contemporary compositions in the genre by English writers. request a contribution to travel expenses, and overnight accommodation when necessary. TBSCo. Inc. also offer workshops and singing schools to traditional folk festivals, and other musical and educational organisations on a negotiable basis, to include travel and other expenses. In order to view this page properly please download the Poor Richard font here.